Our aluminum vents are made by Urban Registers and come bare to leave as is or for you to paint. The floor return grille is just an open vent so no damper is included to close off the air. These aluminum vents are durable enough to use both indoors or outdoors to diffuse your airflow. The floor return grille is handcrafted upon order and can take 3 to 4 weeks to ship to you. To purchase your aluminum vents correctly, you must measure your actual hole opening on the floor. That is because the floor return grille has a larger faceplate dimension which will sit on top of your floor. Installation of the aluminum vents is simple, order with or without screw holes for mounting securely into place. Urban-128 12 x 8 13 7/8" x 10"
Important: Our floor return grille is made upon order which means it could take 3 to 4 weeks to ship. The aluminum vents can be left bare but may oxidize over time by natural causes. Paint the floor return grille to match your decor but once painted, considered non returnable. Tip: When trying to order aluminum vents correctly, please do not measure your existing floor grille. Measure your actual floor ductwork to make sure these vent will cover the hole properly. The 14 x 14 floor return grille will cover a hole measuring 14 x 14 inches and will have an outside faceplate which measures larger. The faceplate of the grille measures approximately 1/4" and the drop in portion will vary. 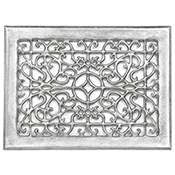 While these aluminum vents are used for the floor, you can find matching decorative grilles for your wall and ceiling also on our website. Purchase your floor return grilles and revamp your rooms decor while being the talk of the town! Size Urban-8-Rnd+Floor 8" Round R.A.G. Urban-10-Rnd+Floor 10" Round R.A.G. Urban-66+Floor 6" x 6" R.A.G. Urban-84+Floor 8" x 4" R.A.G. Urban-88+Floor 8" x 8" R.A.G. Urban-102+Floor 10" x 2" R.A.G. Urban-104+Floor 10" x 4" R.A.G. Urban-106+Floor 10" x 6" R.A.G. Urban-108+Floor 10" x 8" R.A.G. Urban-1010+Floor 10" x 10" R.A.G. Urban-124+Floor 12" x 4" R.A.G. Urban-126+Floor 12" x 6" R.A.G. Urban-128+Floor 12" x 8" R.A.G. Urban-142+Floor 14" x 2" R.A.G. Urban-144+Floor 14" x 4" R.A.G. Urban-146+Floor 14" x 6" R.A.G. Urban-1410+Floor 14" x 10" R.A.G. Urban-1414+Floor 14" x 14" R.A.G.